It was a very long and tension filled day, but I made it through the Cream Cheese Competition with a few awards this year! Out of twenty-three “New Cream Cheese Recipe” entries, my It’s a Mouthful cake won runner up. And out of seventeen cheesecakes entered, my Raspberry Truffle Cheesecake also won runner up. I’m proud of myself, but a little disappointed too. This probably sounds stupid, but I really wanted to win some prize money to justify buying myself the really nice camera bag I’ve been coveting for a very long time. So winning two runner up positions – with no prize money – feels kind of like a big joke on me. I did a good job, but just not good enough to buy that camera bag. It upsets me a lot more than it probably should. At least I won something. I’m happy about that. Anyway! 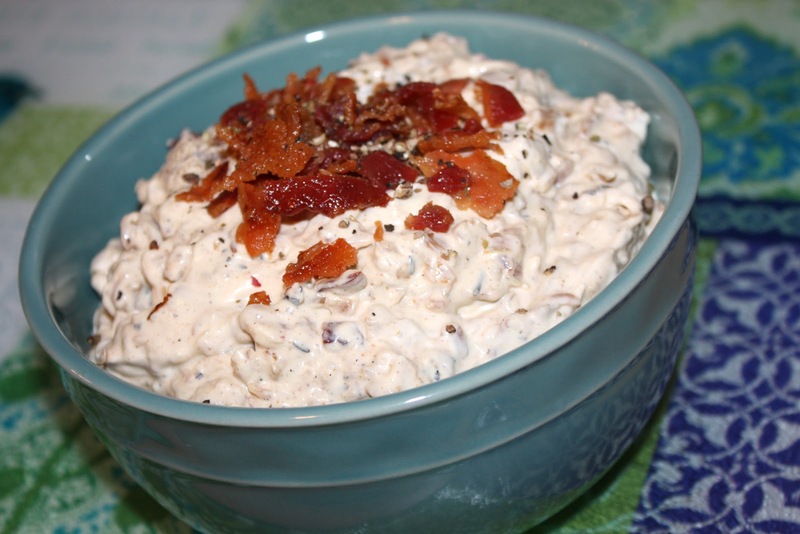 I’m sharing my dip recipe today – the one that DIDN’T win an award. I still think it’s pretty delicious, though, and I don’t normally eat onions. I could probably eat a whole bowl of this. Also, I should mention to my facebook friends that helped me come up with a name, that the emcee was completely in love with the “Pig and Stink” title. I was worried it might be offensive, but I liked it too much to change it. Okay, back to the dip. The first thing you need to do is bake an entire package of bacon in a 375 degree oven for 15-20 minutes, or until crisp. Reserve three of those pieces and fry them in a skillet. After the bacon is cooked you caramelize two diced onions with a mixture of salt, thyme, and cayenne pepper. Before making this dip for the first time a few weeks ago, I had never caramelized onions before. I was shocked at how long it took me (over an hour). I still have no idea what I did wrong that first time, but it went a little faster the second time and turned out a lot better. The onions got darker and seemed to be infused with a lot more flavor. 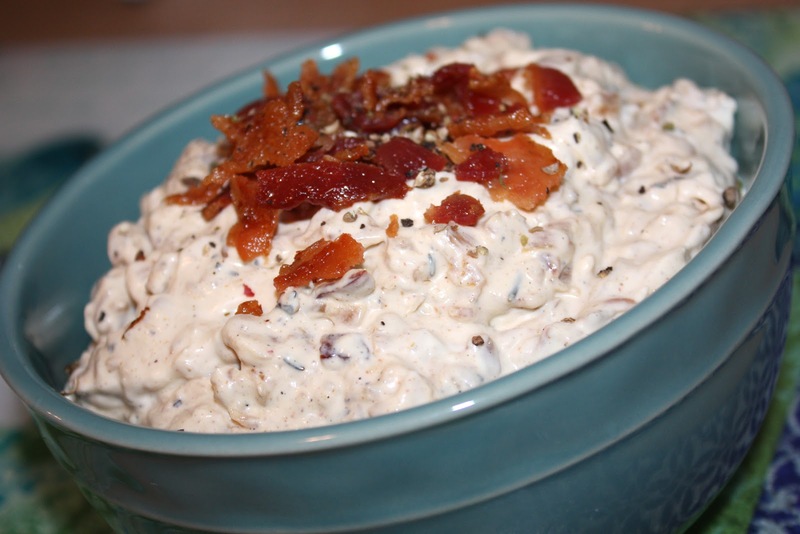 After the bacon and onions are cooled a bit you just mix it all together with the cream cheese, sour cream, Worcestershire sauce, honey, and crushed peppercorns. It ends up being a slightly spicy blend of pepper, onion, and bacon that tastes (in my opinion) amazing. I hope you enjoy it too! Heat oven to 375 degrees. Line two baking sheets with aluminum foil. Lay out bacon slices on sheets, reserving three slices for the next step. Bake for 15-20 minutes until crisp and set aside. Heat a large skillet on medium heat. Place remaining three bacon slices in skillet and fry until crisp. Remove and set aside. Add the diced onions, thyme, salt, and cayenne pepper to the skillet and saute for 20-30 minutes until darkened, but not burned. Remove from heat and let cool. In a large mixing bowl combine cream cheese and sour cream until light and fluffy. Add Worcestershire sauce, honey, and black pepper and mix until smooth. Crumble all the bacon into small pieces. Reserve about two tablespoons for topping. 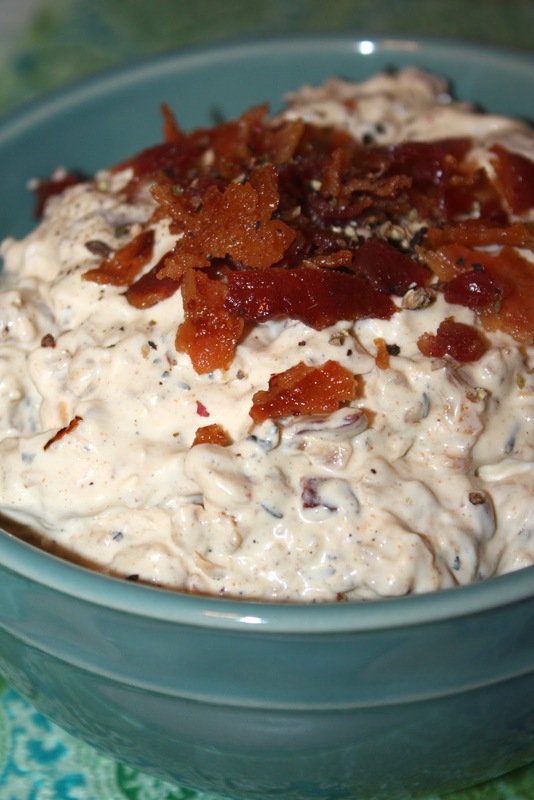 Add remaining bacon and onions to dip mixture and blend until combined. Top with reserved bacon and eat with chips or vegetables.